Newsells Park Stud is enjoying a tremendous sale so far with their consignment at Tattersalls Book 1 Sale this year. The highlight being the sale topper today and highest priced yearling this year, Lot 304, a daughter of Dubawi out of Loveisallyouneed, a daughter of the wonderful mare Jude, selling to MV Magnier for 2.1 million guineas. Underbidders included Tony Nerses, whose owner Saleh Al Homaizi was in charge of bidding and went to 1.5 million guineas, leaving John Ferguson and MV Magnier to carry on. MV Magnier was buying on behalf of Richard Henry, boss of Coolmore’s advertising arm Primus Advertising and said: “This is a lovely filly, a great mover with a lot of quality. I think he was overcome with emotion,” referring to the fact that Henry owned Jude, the wonderful stakes-producing grand-dam of this filly. “I sold Loveisallyouneed,” said Henry, “and just after that Jude died. I wanted to get back into the family – it has been so good to us. We counted up – there are 12 Group winners on the page, including seven Group 1 winners and we raced three of them. Henry originally bought Jude here, and she went onto produce six stakes horses, including the Group 1 fillies Quarter Moon, Yesterday and All My Loving. She is out of the brilliant broodmare, the recently deceased mare Last Second, dam of the French 2000 Guineas winner Aussie Rules. “Yesterday is in-foal to red-hot first season sire Zoffany, and Quarter Moon has produced two high-class fillies by Fastnet Rock in Group 1 winner Diamondsandrubies and Classic prospect for next season How High The Moon. Hopefully this filly might be as good as them!” added Henry. Julian Dollar of Newsells Park Stud explained how the farm came to own Loveisallyouneed. “We were underbidders to Paul Makin on Song, a daughter of Jude, at the December Sale and I thought that would be our chance to get into the family. “But in the spring Richard called me to say that Loveisallyouneed had been injured, wouldn’t race and asked if I would be interested in looking at her? I went over and it took me all of one second… she is a beautiful mare. “We covered her first by Dansili, which seemed obvious thing to do, but she was not a runner and then her Oasis Dream died. She has a Dansili at foot and is in foal to Dubawi. “Some people said we were crazy to offer this filly, but we sell pretty much everything, we are a commercial operation and everyone knows that. I was concerned about putting all our eggs in one basket, but it has been a strong sale and worked out well. 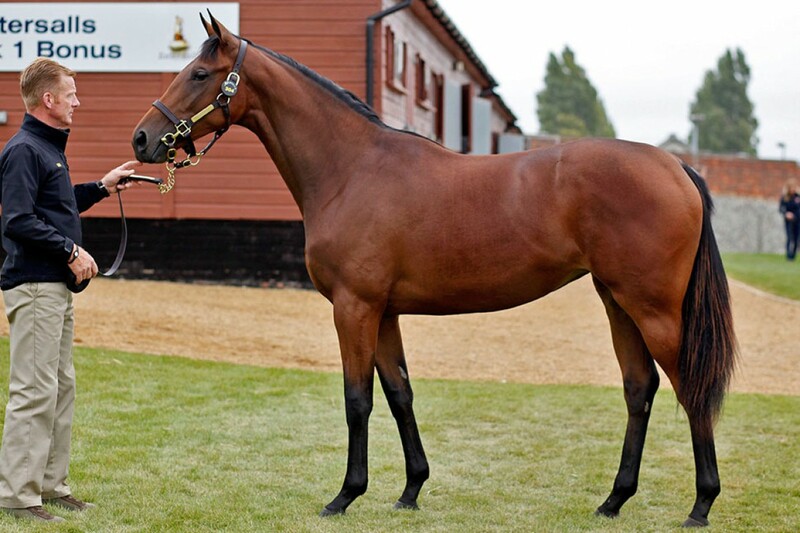 Yesterday, Legatissimo’s half-sister by Redoute’s Choice was purchased by MV Magnier for 725,000gns. Magnier confirmed that Legatissimo will stay in training at four, to date she has won the Gr.1 1000 Guineas, Qatar Nassau Stakes and the Coolmore Fastnet Rock Matron Stakes, and she now bids for a hat-trick of consecutive Group 1 wins in the Breeders’ Cup Filly and Mare Turf on Saturday 31st October.